On holiday in Morocco again and the two wheeler radar is ever on. 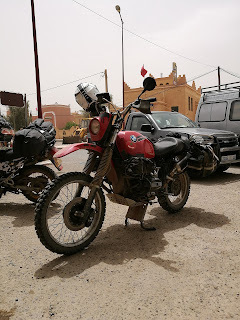 Motorcycling in Morocco is about as good as it gets if you enjoy touring and hitting the odd gravel road so I've got to admit to some jealousy for the guys and gals getting around by bike as I'm piloting a hire car around. 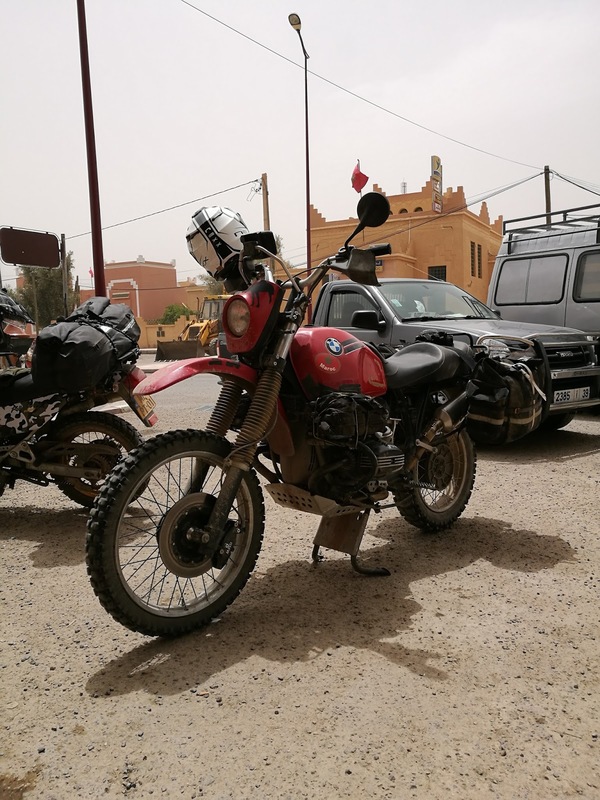 It's been good to see a number of older bikes getting used as intended, a fair number of airhead BMW GSs out and about plus Africa Twins are perennially popular. 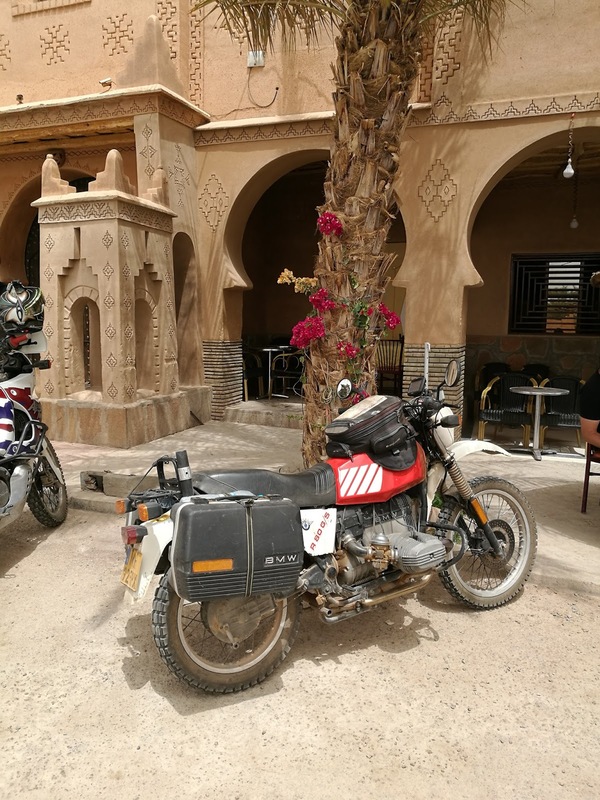 On the road we came across three British registered new generation Enfield Bullets on tour plus witnessed the sight of dozens of Monkey Bikes traversing the Northern fringes of the Sahara on the Monkey Run. 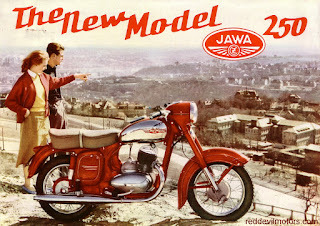 In terms of local wheels French mopeds are still abundant but are slowly being replaced by Chinese Honda Cub knock offs. 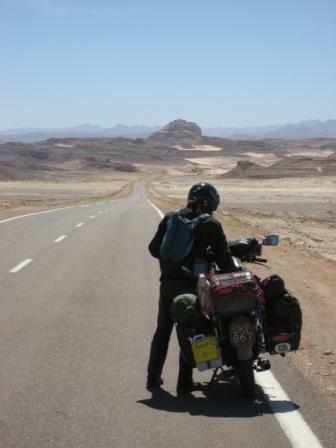 Honda Africa Twin where it was destined to be. 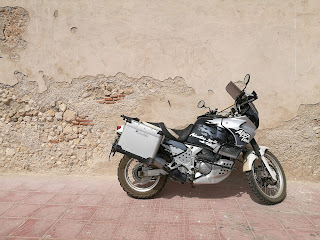 Modded BMW GS on Dutch plates. 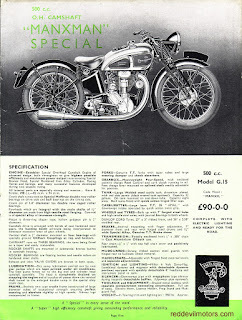 Velocette were unusual amongst British manufacturers in offering their very own design of pannier frame and rack rather than relying on something off the shelf from the aftermarket guys. Not to worry, I stuck with what I had got. I cut the old channels out and passed the frames on to my father who, with considerably finer sheet metal skills than I, had kindly agreed to bend up new channels and braze them in. Job done and off to the local powder coating guys.who did a decent job of blasting and painting them within a week (thank you PMA / United of Sturminster Marshall). With a few new nuts, bolts and washers the pannier frames bolted on nicely. 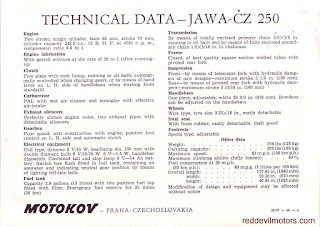 I tried them out first with a pair of ex-RAF canvas knapsacks from the early fifties but they were slightly too 'flappy'. My memory turned to a pair of leather panniers that I had bought years ago at Moto Legendes because they were just so lovely but had never gotten round to using. 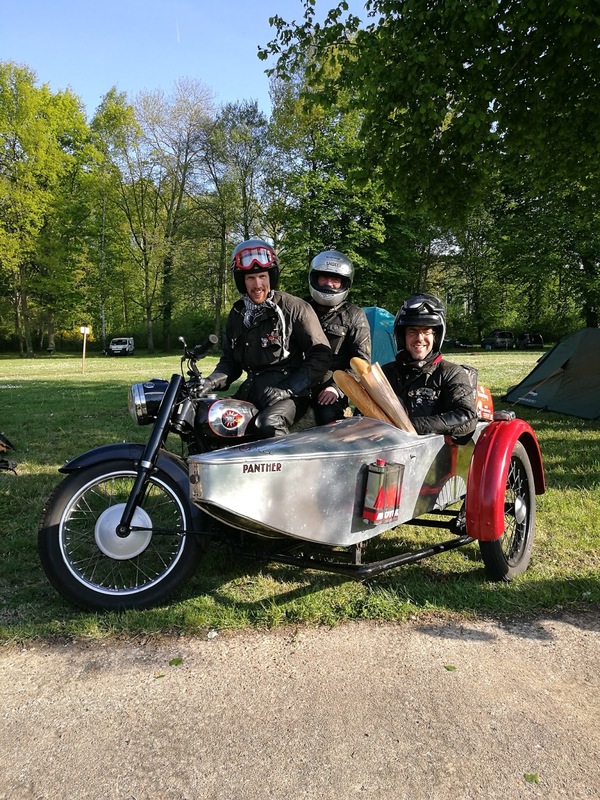 They needed a little bit of drilling (they are aluminium backed) and a couple of clips and are just the job - I believe they are ex-French Police panniers. 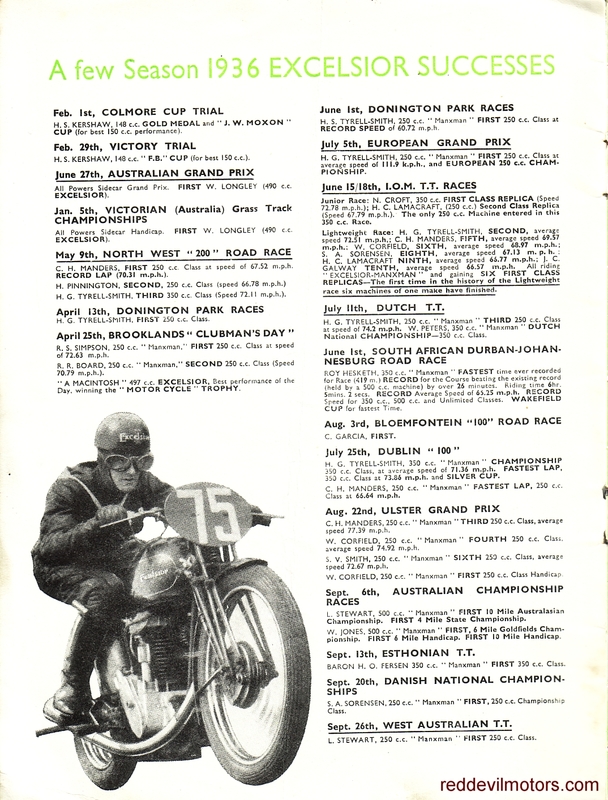 Job done, more than happy with the result and now ready with some period luggage to ride over to the Vintage Revival at Montlhery next month. 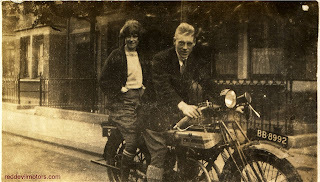 A couple of snaps of a lucky chap and family with his Triumph Ricardo four valve model. 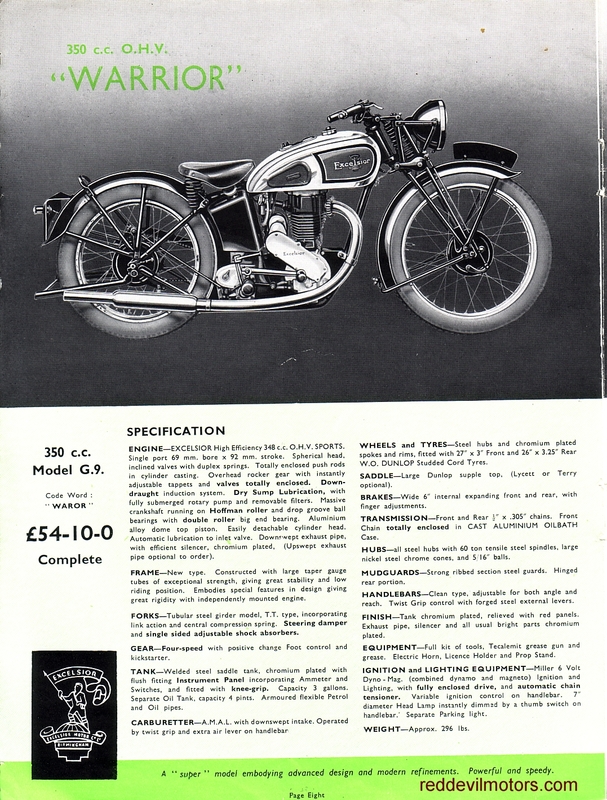 Pretty much the cutting edge of sports bikes when it was new the Ricardo was named after famed engine designer Sir Harry Ricardo. 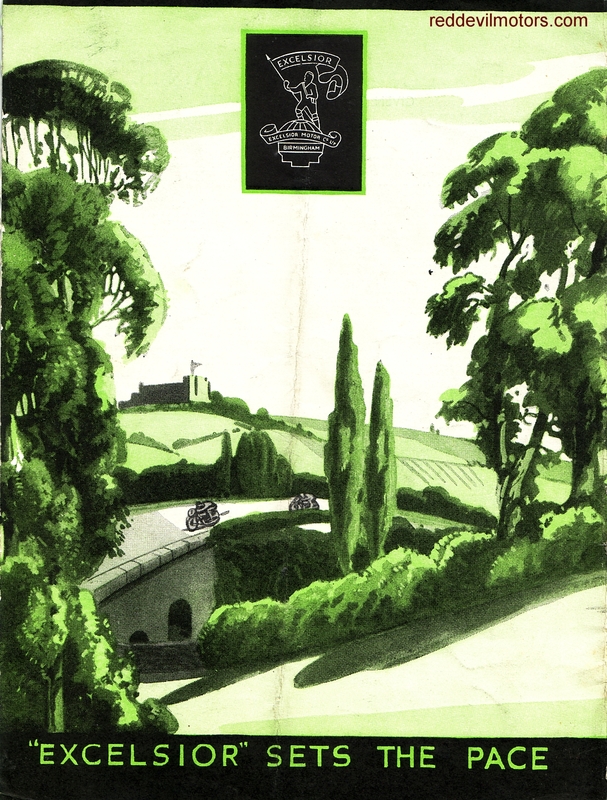 The company Sir Harry founded is still going strong as Ricardo PLC. 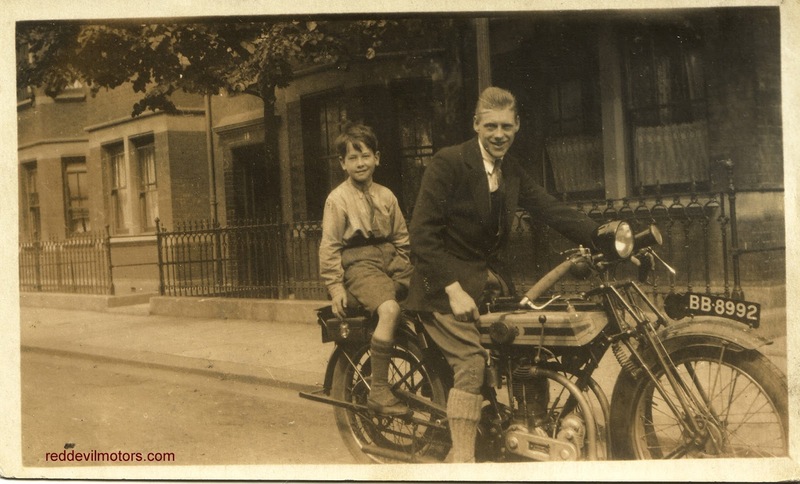 The picture has 1924 penciled in on the reverse and the bike looks like a '23 or '24 model. 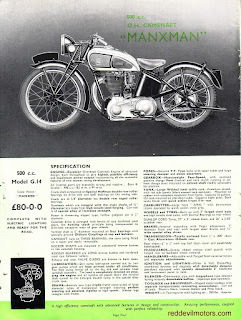 Triumph Ricardo - cutting edge sports bike of the day. 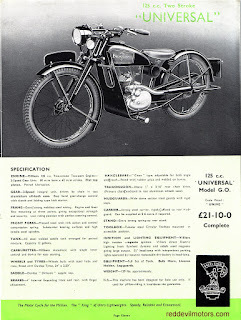 A nice simple mod this and I make no claim of originality of thought. 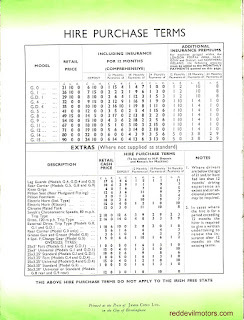 An easy project for a lathe rookie like myself: particularly useful on an occasional recalcitrant starter like a Velo where every so often you might engage in several energetic lunges at the kick start and then, just at that point where it seems like your luck is at it's very bottom and you are exhausted, the kick start rubber falls off as if to mock you. 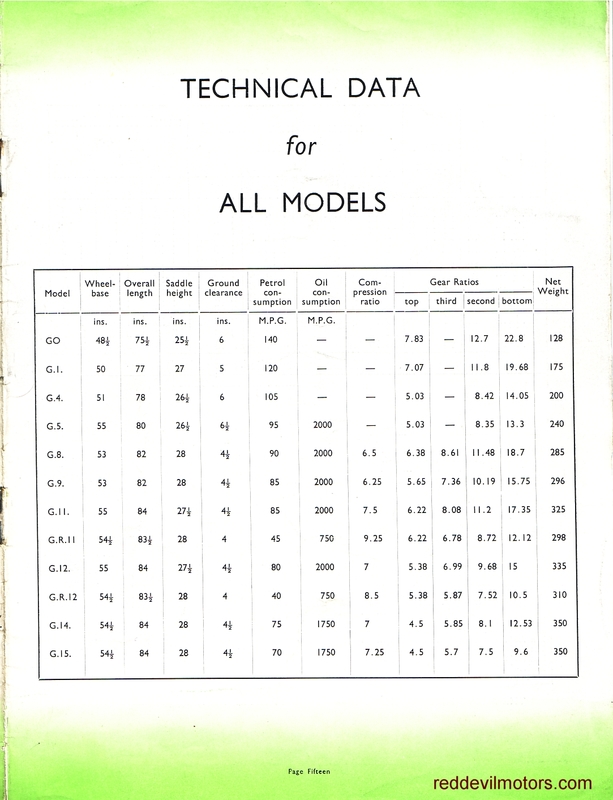 The job took even a very amateur lathe-ist such as I less than an hour to do. 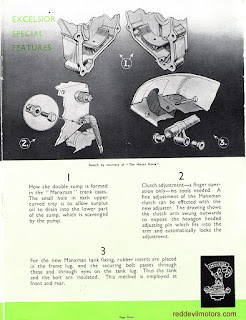 First step is to take off the folding part of the kickstart off sans rubber, put it in the lathe and face the end off flat. 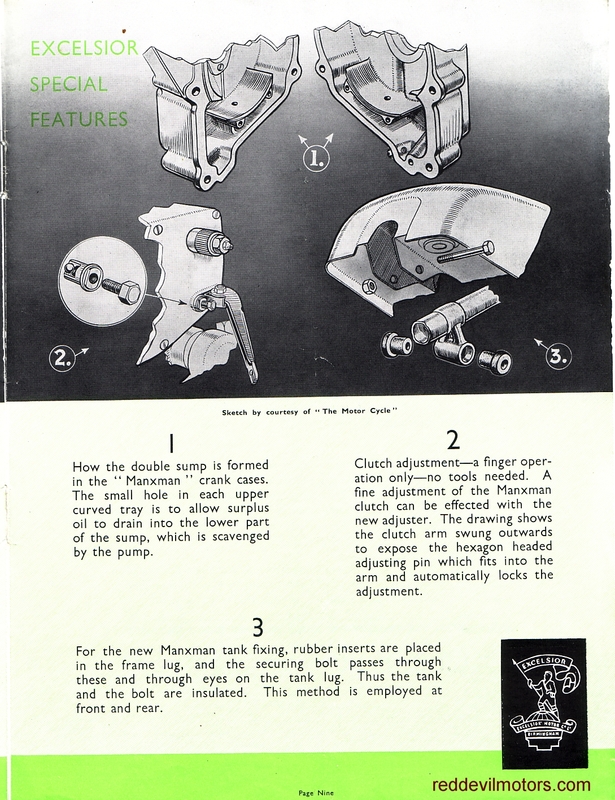 Source a suitable countersunk machine screw and then drill the appropriate sized hole in to the newly faced kick start lever. Tap the hole for the machine screw and the job is half done. 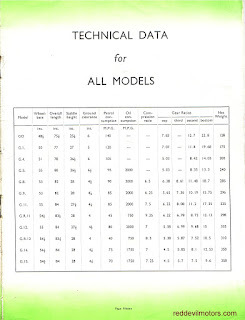 Next step find a suitable piece of scrap alloy and drill and countersink it to suit the screw, turn down to size, shape with a file and cut to length. 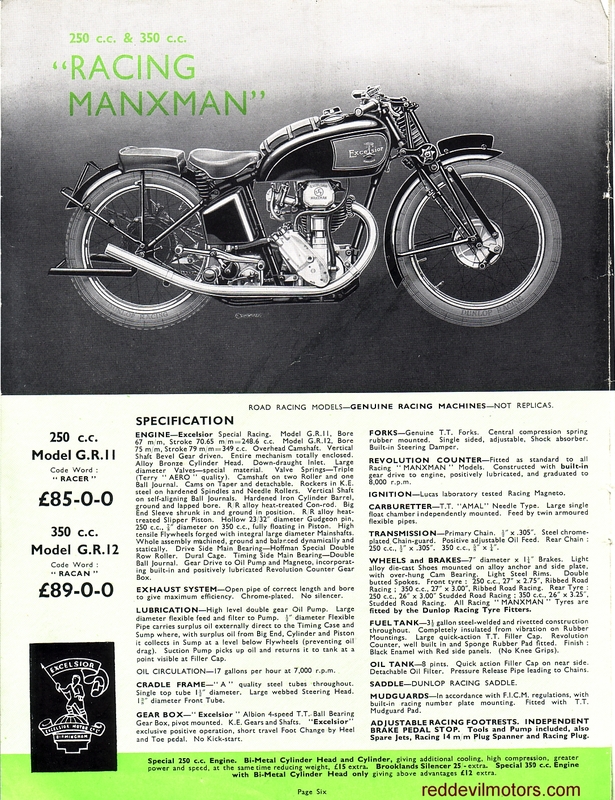 All that remains is to cut a hole in to the closed end of the rubber, assemble the lot and presto - detaching kick start rubber woes gone. 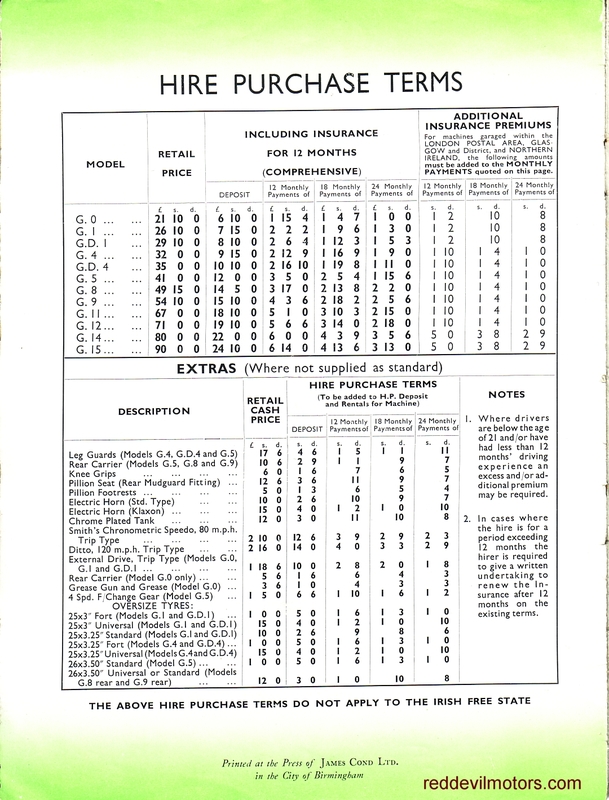 Brochure for the Excelsior range 1937. 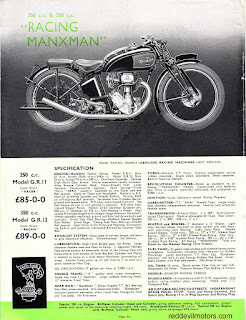 The Manxman models are well known but all the rest are real rarities nowadays. 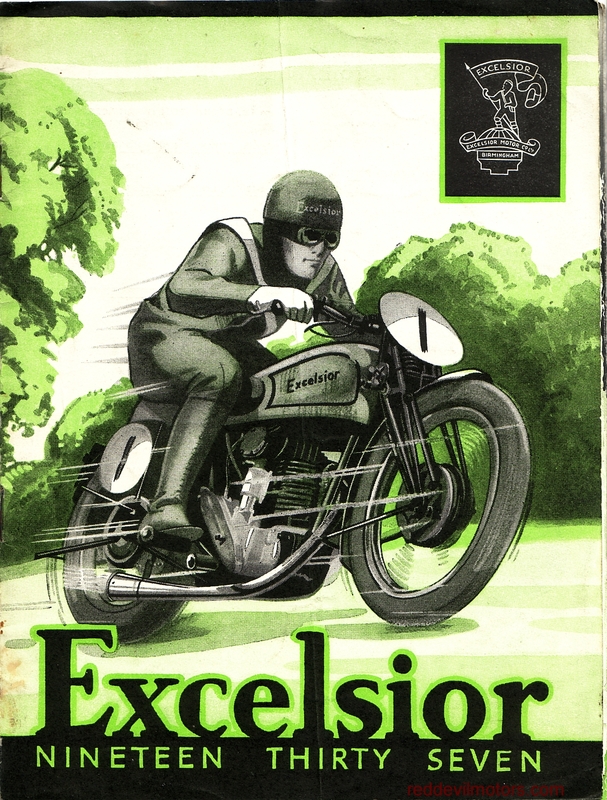 Excelsior 1937 range front cover. 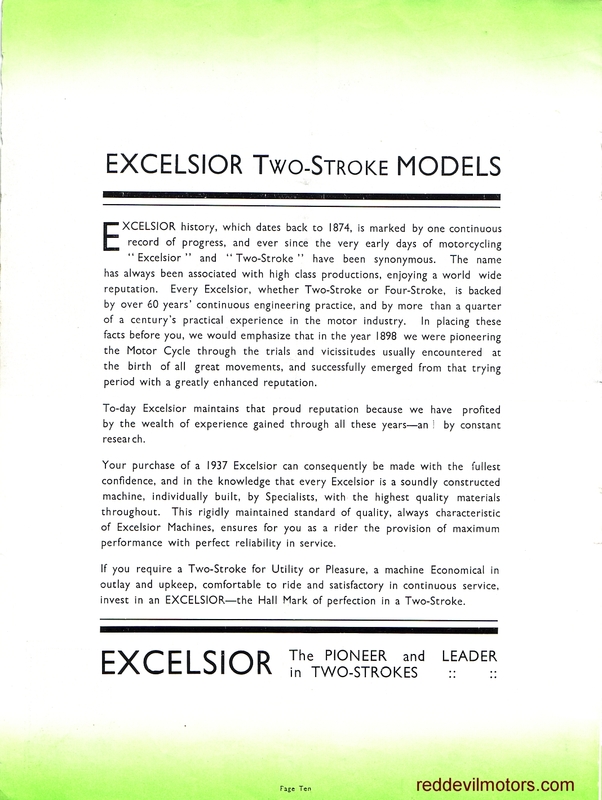 Excelsior 1937 range page 1. 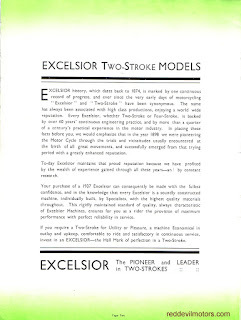 Excelsior 1937 range page 2. 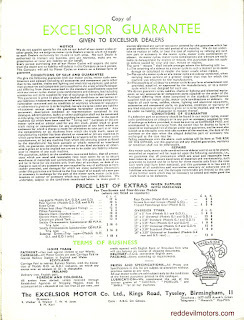 Excelsior 1937 range page 3. Excelsior 1937 range page 4. 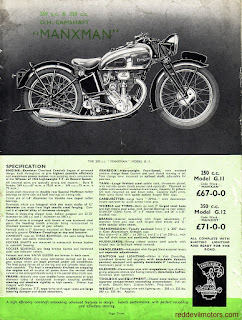 Excelsior 1937 range page 5. Excelsior 1937 range page 6. 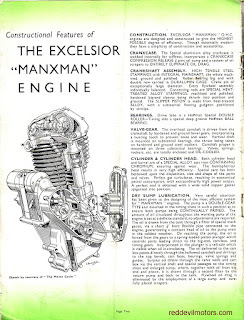 Excelsior 1937 range page 7. 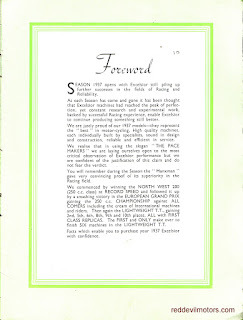 Excelsior 1937 range page 8. Excelsior 1937 range page 9. 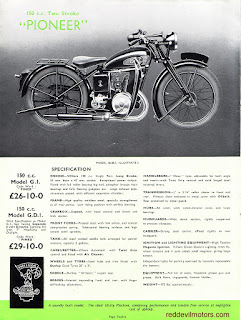 Excelsior 1937 range page 10. 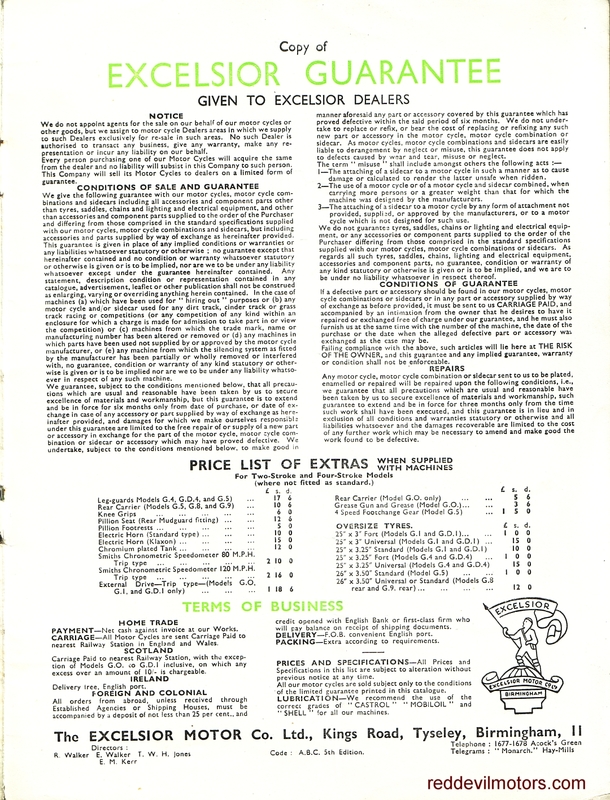 Excelsior 1937 range page 11. 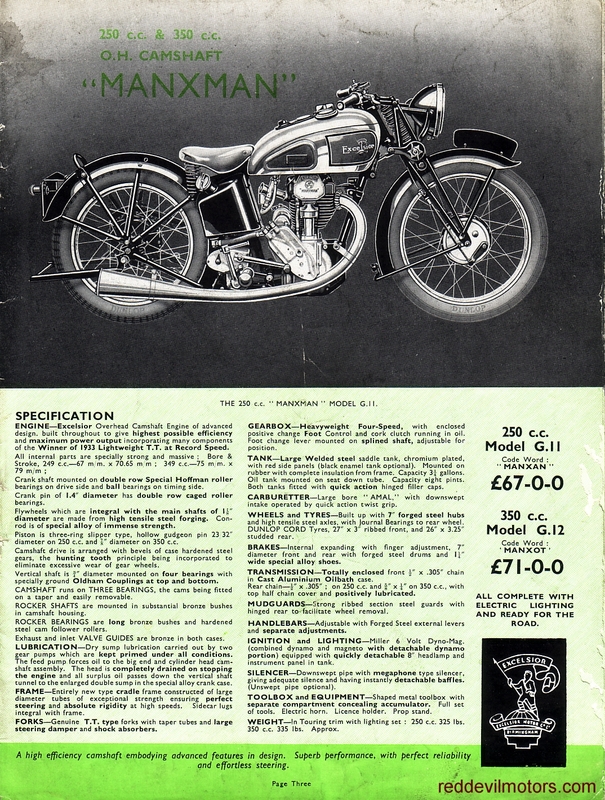 Excelsior 1937 range page 12. 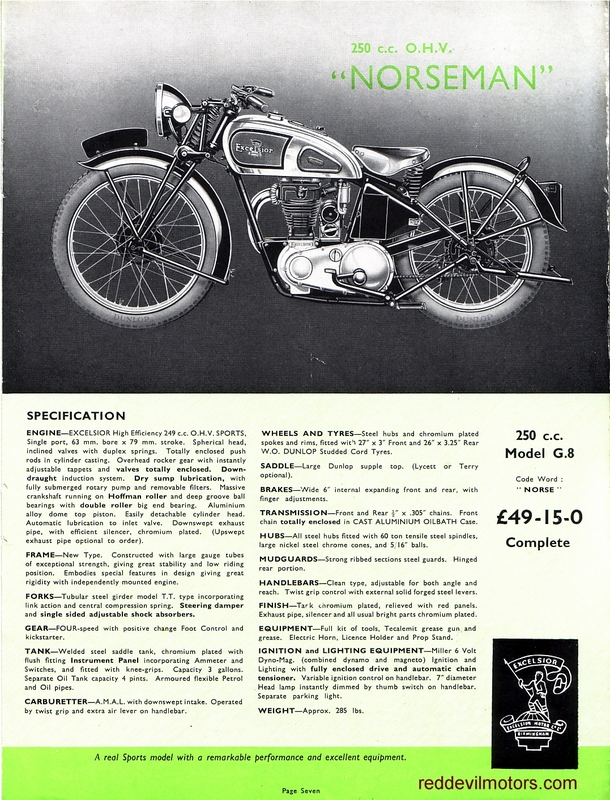 Excelsior 1937 range page 13. 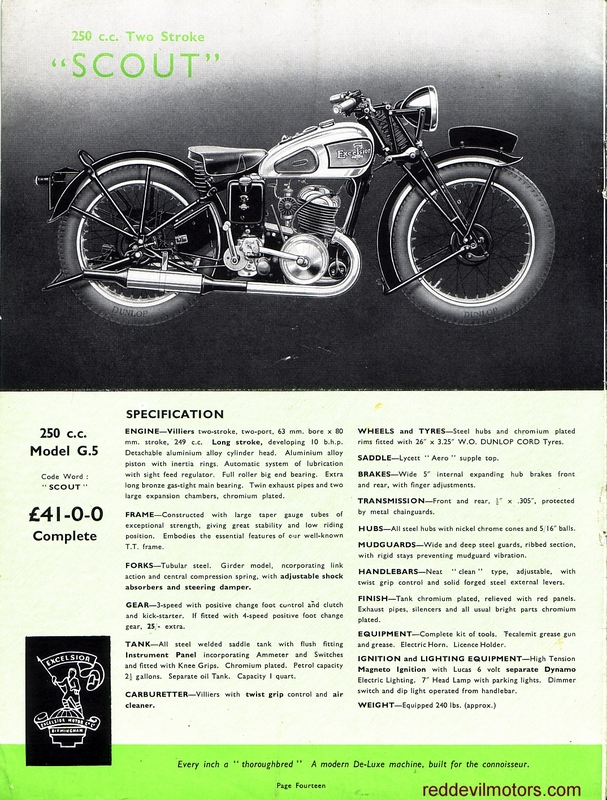 Excelsior 1937 range page 14. 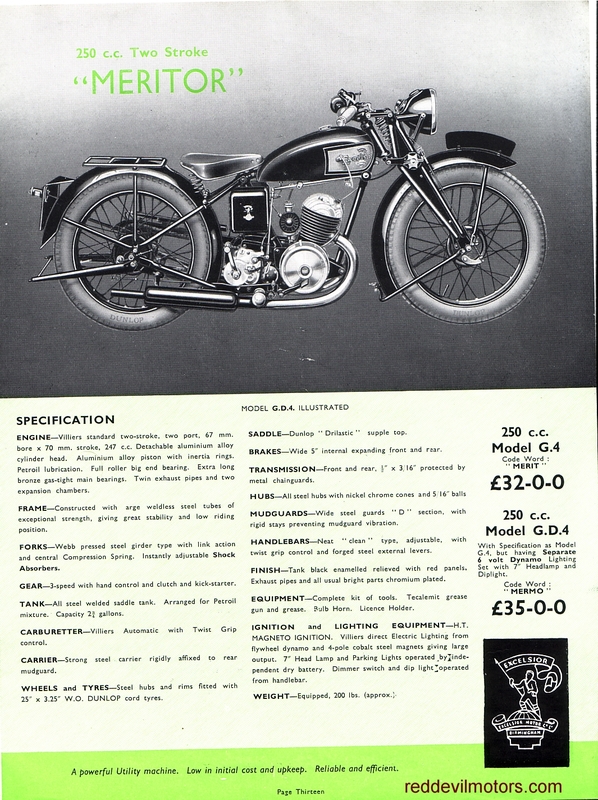 Excelsior 1937 range page 15. 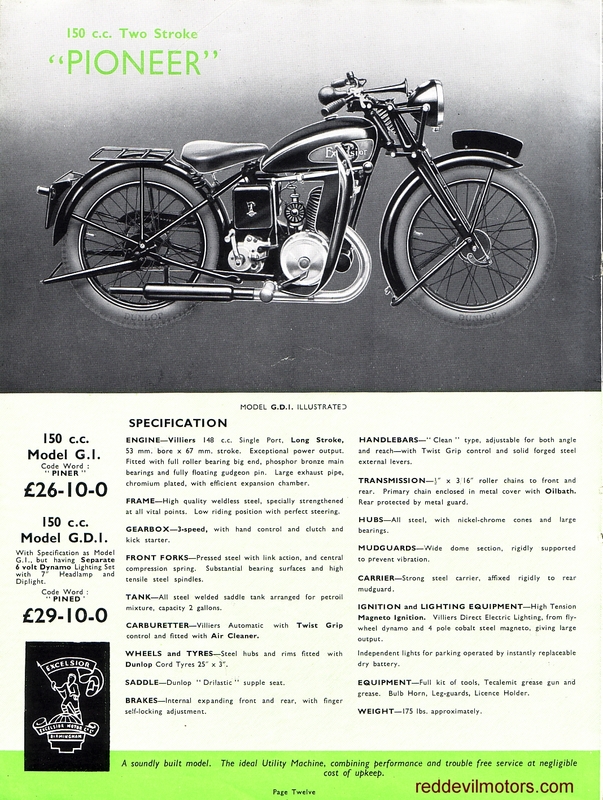 Excelsior 1937 range page 16. 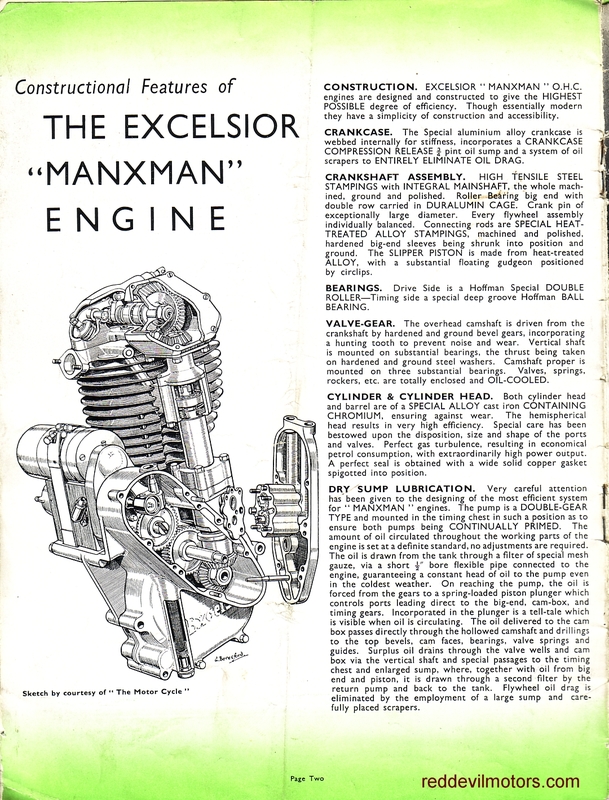 Excelsior 1937 range page 17. 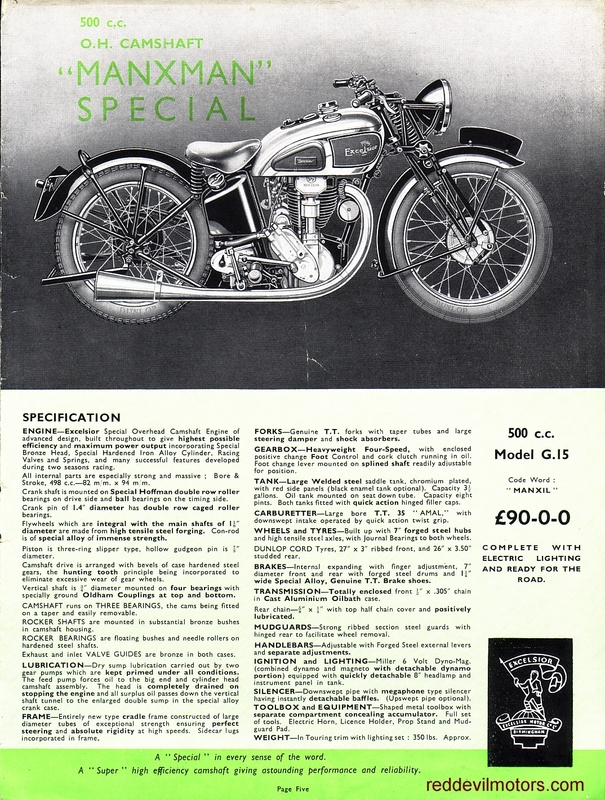 Excelsior 1937 range page 18. Excelsior 1937 range rear cover. 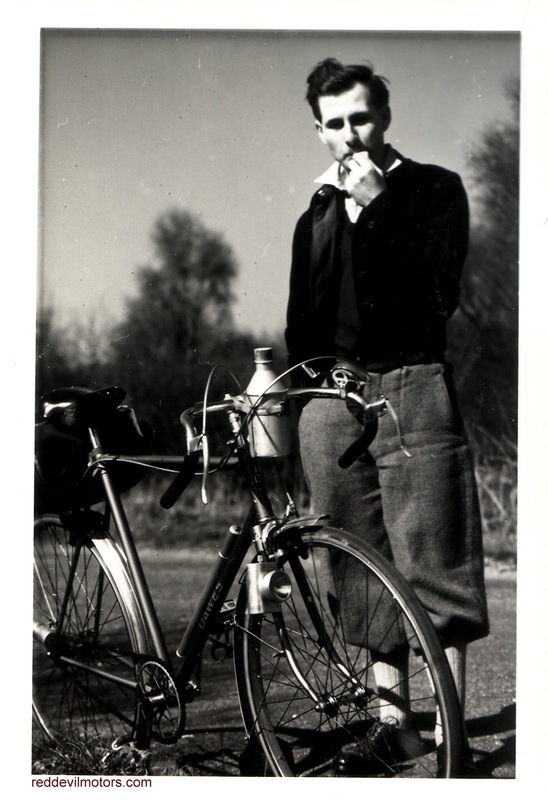 There's a lot to love about this snap of a gent out with his Dawes road bike. 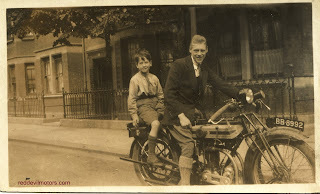 From the clothing style and the cycle the picture was more than likely taken in the thirties. The cycle is nicely accessorised with lights, saddle bag and aluminium water bottle but the show stealer is the gent's plus fours. Is he just about to take a drag on a sly ciggy! 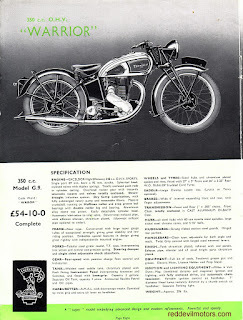 Dawes road bike from the 1930s. 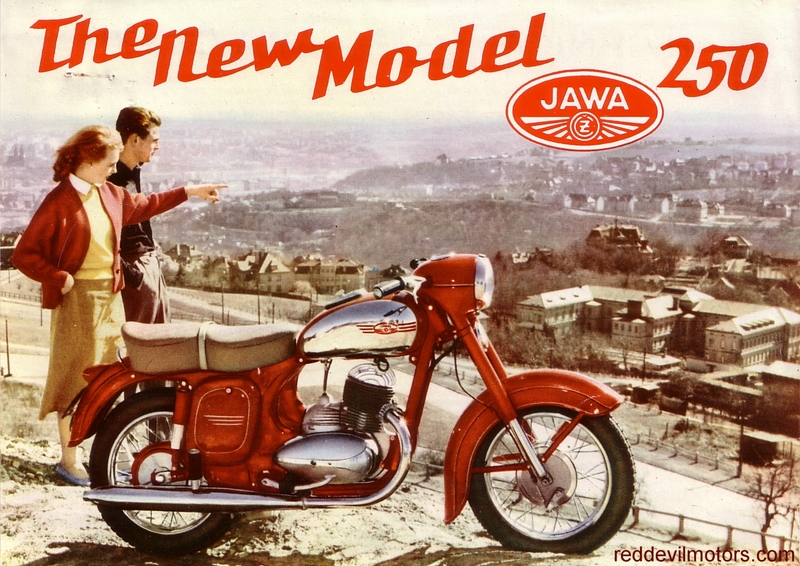 Flyer for the new Jawa 353/04 twin port 250cc two stroke single from 1958. 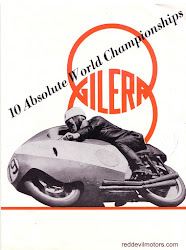 More snaps from a recent visit to Sammy Miller's Museum. 175cc AKD. 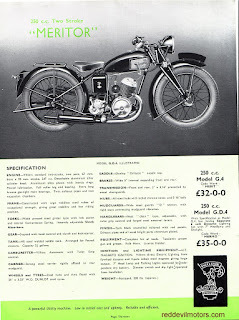 An unusual engine size for a twenties Brit bike. WW1 era. This is a Kingsbury. Close up on the Whippet. Neat little ohv motor. 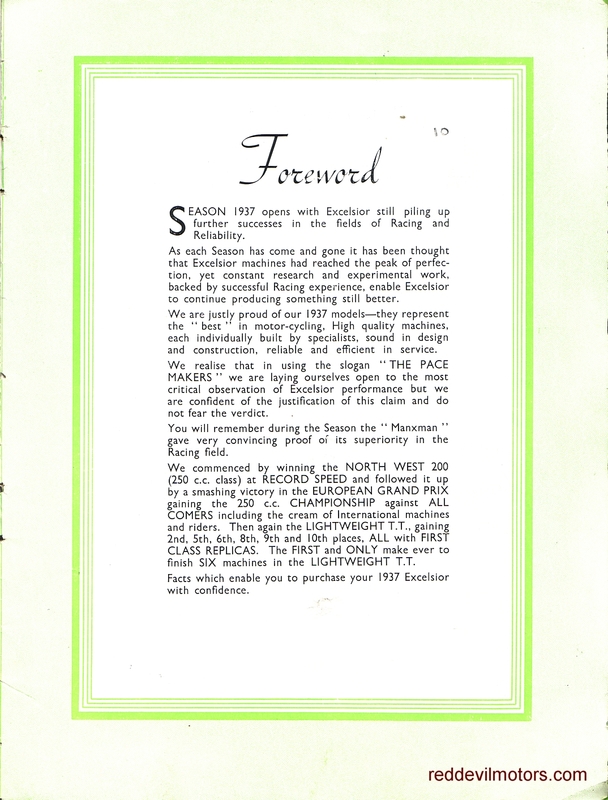 Another view of the Henderson. And the FN's power plant. Great front number plate fixing on the Minerva. And the Minerva in all its glory.